The Isle of the Thunder King is a large island off the Townlong Steppes where Alliance and Horde forces will work with the Shado-Pan to assault the citadel of Lei Shen, the Mogu Emperor, who is often referred to as the Thunder King. The assault is made of several stages. Unlike previous similar events, such as the Firelands Invasion of Patch 4.2, progression through the stages is done on a server-wide basis. This means that everyone on your server will open new stages at the same time. The island offers a lot more than just daily quests. There will be a very large amount of fun achievements (ranging from very easy to very difficult) that you can try to complete. As always with this kind of in-game event, there is a lot of lore-related material to discover, for those interested. The Isle of the Thunder King houses the Throne of Thunder raid instance. Access to the raid instance is not tied to the progress of the assault, as the Shado-Pan have managed to uncover a hidden passage leading to the heart of the citadel. The invasion of the Isle of Thunder consists of 6 stages, which your server will slowly unlock by helping the Shado-Pan destroy the Zandalari, Saurok, and Mogu defenses. Contributing to the invasion takes the form a short quest line that will be offered to you every day. In addition, during your time on the island, you will find many items and objects that will allow you to complete a myriad of achievements. Finally, there are a few rewards that you can earn, including item level 496 gear. The Isle of Thunder gives you access to two new factions: the Shado-Pan Assault and the Kirin Tor Offensive (Alliance) or the Sunreaver Onslaught (Horde). While reputation with the Shado-Pan Assault is mostly earned inside the Throne of Thunder raid, there is a weekly quest on the Island that offers 300 reputation. Please refer to our Throne of Thunder Preview for a detailed list of the rewards available from the Shado-Pan Assault. Reputation with the Kirin Tor Offensive and the Sunreaver Onslaught is earned through doing daily quests on the island. You will need about 3 weeks to reach exalted reputation. Later in the guide, we explain how you can increase your reputation faster. It is also important to note that while doing your daily quests on the island, you will get to kill a lot of mobs that reward reputation with the Black Prince. In order to increase your reputation gains with the Kirin Tor Offensive or the Sunreaver Onslaught, you can choose to champion them in the reputation tab of your character panel. This will cause you to gain addition reputation when doing various activities, but mostly through running Heroic dungeons and scenarios. The event is made up of 6 stages. As you progress through the stages, the daily quest line offered to you changes (and so do the rewards, albeit slightly). Arcane Troves (Alliance) and Sunreaver Bounties (Horde) are chests, which can contain a number of items, such as Shan'ze Ritual Stones or Elder Charms of Good Fortune. Progression through a stage is done on a server-wide basis. This means that everyone on a given server gets access to the next stage at the same time. When players from either faction complete their daily quests, they move the event forward a little. After a few days, the current stage is completed and the next one is unlocked. While questing on the island, you will sometimes loot important items or encounter unusual objects. In the table below, we list these items and objects and explain briefly what to do with them. Key to the Palace of Lei Shen Each key grants you one run through the Troves of the Thunder King. We cover this loot run scenario in a specific section. Shan'ze Ritual Stone These stones are used to summon bosses around the islands. There are 9 bosses that you can summon and killing some of them is the objective of a weekly quest that rewards 150 . There are also two achievements related to killing these bosses. We explain everything in more details in a section dedicated to the Shan'ze Ritual Stones. These incantations are used to summon Mogu kings in the Court of Bones area. There are two achievements related to defeating these kings. For more explanations, please refer to our section dedicated to these Mogu kings. Zandalari Journals As we explain in our achievements section, there are 5 Zandalari Journals that you have a chance to loot from the Zandalari mobs on the island. Collecting them all grants you the Zandalari Library Card achievement. Tattered Historical Parchments In exchange for these parchments, your faction's quartermaster on the island will give you items that increase your reputation with the Kirin Tor Offensive or the Sunreaver Onslaught. For more information about the reputation grind and how to speed up the process, make sure to check our reputation grind section. Head of the Chamberlain This object, which you can encounter in many different locations on the island starts a weekly quest that rewards 1x Shan'ze Ritual Stone. See our Shan'ze Ritual Stones section for more details. Trove of the Thunder King This chest can randomly appear in many different spots on the island. It can contain a number of items, like Shan'ze Ritual Stones or Elder Charms of Good Fortune, and looting it grants an achievement. For more information, please refer to our achievements section. As your reputation with the Kirin Tor Offensive or the Sunreaver Onslaught increases, you will unlock new rewards, which you can buy from faction's quartermaster: Hiren Loresong at Violet Rise (Alliance) or from Vasarin Redmorn at Dawnseeker's Promontory (Horde). There are also rewards that will be automatically given to you as you progress through the event. After reaching honored reputation, your faction's quartermaster will sell you item level 476 gear. Each item costs 300 . After reaching revered reputation, your faction's quartermaster will sell you item level 496 gear. Each item costs 937 . After reaching exalted reputation, your faction's quartermaster will sell you more item level 496 gear. Each item costs 937 . One of the island's rare elites, the Haywire Sunreaver Construct has a chance to drop a pet called Sunreaver Micro-Sentry. 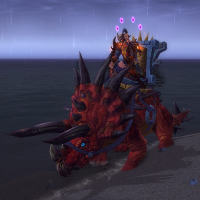 After reaching exalted, your faction's quartermaster will sell you an epic ground mount for 3000 : Reins of the Golden Primal Direhorn (Alliance) or Reins of the Crimson Primal Direhorn (Horde). Engineers will also be able to learn how to craft an epic flying mount: Sky Claw (see the profession rewards section). 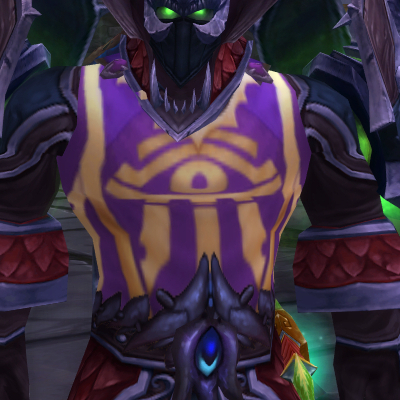 After reaching exalted, your faction's quartermaster will sell you a tabard for 10 : Kirin Tor Offensive Tabard (Alliance) or Sunreaver Onslaught Tabard (Horde). Your faction's quartermaster will sell you Blood Spirits for 400 . In addition, after reaching Stage 4, you will be able to obtain new profession patterns. * Lightning Steel Ingots and Stabilized Lightning Sources are reagents for the recipes presented above. Should you lose the Kirin Tor Beacon or Sunreaver Beacon, you can purchase another one from your faction's quartermaster for 25 . Your faction's quartermaster will also sell you items that will be very useful during the loot run scenario. Doing the daily quests every day will cause you to often cap your Elder Charms of Good Fortune, so buying these items can be a good way to get rid of them. There are 26 achievements that you can earn on the island. We detail them all in our achievements section. You cannot use your flying mounts on the island and it is often faster to travel on water. Therefore, we recommend you to use a mount that can walk on water, such as the Reins of the Azure Water Strider. The entire event starts with Thunder Calls (Alliance / Horde), which you will automatically receive in the Vale of Eternal Blossoms after completing the Landfall achievement of your faction: Operation: Shieldwall Campaign (Alliance) or Dominance Offensive Campaign (Horde). After completing Thunder Calls, you will be offered The Storm Gathers (Alliance / Horde). Speak with Vereesa Windrunner (Alliance) or Scout Captain Elsia (Horde) to be provided transport to the Isle of Thunder. Below, you will find a map of the island. We indicated when each area becomes available. 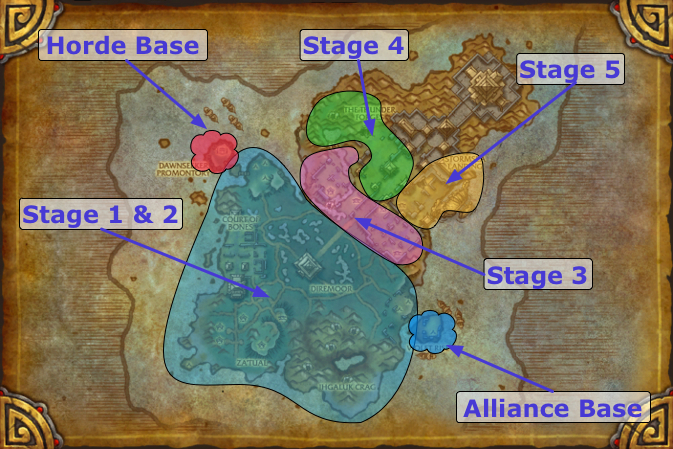 The Alliance and Horde bases only become available after finishing Stage 1. After landing on your faction's main ship off the coast of the island, you will be able to turn in The Storm Gathers (Alliance / Horde) to Lady Jaina Proudmoore (Alliance) or Lor'themar Theron (Horde). You will receive a Kirin Tor Beacon (Alliance) or a Sunreaver Beacon (Horde). These items enable you to teleport back to your daily quest hub, and they do not share a cooldown with your Hearthstone. Your faction's leader will then give you Allies in the Shadows (Alliance / Horde), which will take you to the Shado-Pan hideout on the island, and the daily quests will open up. At the Shado-Pan hideout, you will receive Secrets in the Isle of Thunder, which is directly tied to the Shan'ze Ritual Stones and the summonable bosses. During Stage 1, you will always get 3 initial daily quests from your faction's main ship. 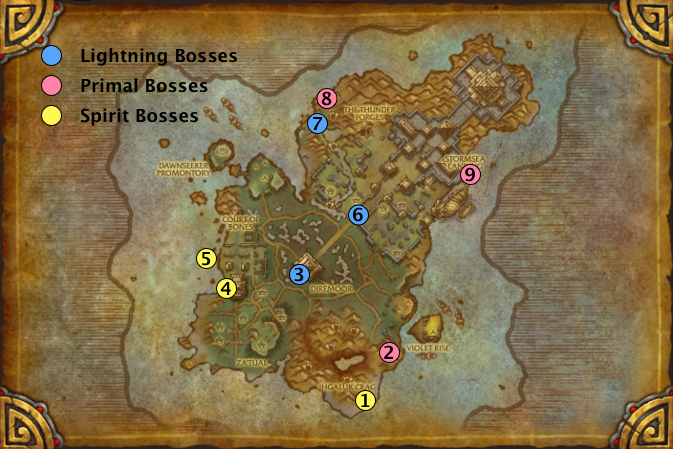 These initial daily quests do not reward anything and only serve to take you to the 3 questing locations of Stage 1: The Court of Bones (Mogu), Za'Tual (Zandalari), or Ihgaluk Crag (Saurok). At each location, you will find a small quest hub where you will receive 3 or 4 daily quests to complete. The total number of daily quests that you will receive at the 3 daily quests locations is 11. For example, you can receive 3 daily quests at the Court of Bones, 4 daily quests at Za'Tual, and 4 daily quests at Ihgaluk Crag. After completing all these quests, you will be given an elite daily quest that requires you to kill an elite mob. In the table below, you will find a list of all the daily quests. The bosses of the daily quests can be tricky, so the next section is dedicated to them. The other daily quests are not difficult, although you will probably need a few days to get used to them. for The Call of Thunder / The Call of Thunder, you need to enter the western crypt. Jaguar Stalker, which puts you in Stealth and causes your next attack to critically hit. There is an achievement for killing a Drakkari God-Hulk (large patrolling troll) under the effect of such a potion or for drinking such a potion just after killing a Drakkari God-Hulk. Note that the first time that you will quest at Ihgaluk Crag, you will be given Skin of the Saurok by Image of Archmage Vargoth or Skin of the Saurok by Magistrix Saia. The quest will automatically complete after you kill one Saurok in Ihgaluk Crap. From then on, your character will automatically transform into a Saurok upon entering the Ihgaluk Crag area, unless you are mounted. This will make it much easier to do your daily quests in that area. Zur'chaka the Bonecrafter, which you need to kill for Among the Bones / Among the Bones, is not very difficult. He is surrounded by a number of Saurok mobs, and we advise you to clear those closest to him before you engage him. Note that if you arrive to his location from the sea, you will avoid most of the mobs that protect the path leading to him. As for the fight itself, Zur'chaka the Bonecrafter sometimes channels Spirit Bolts, which you need to interrupt. When he channels Fountain of Skulls, make sure to step aside if one of the skull he throws is about to land at your location. Arcweaver Jor'guva, which you need to kill for Competing Magic / Competing Magic, is more dangerous. When he casts Arcane Explosion, move away from him. When he casts Arcane Slam, move out of the ground effect. When he casts Arcane Storm, he creates a small Arcane ball that flies around the area. If you get too close to the ball, it will turn into a very damaging storm. As soon as your server completes Stage 1, you will be able to help your faction establish a foothold on the island. Lady Jaina Proudmoore will give you The Assault on Shaol'mara and Lor'themar Theron will give you The Assault on Zeb'tula. After receiving your faction's quest, simply talk to Jaina or Lorthemar to enter the scenario. The scenario itself is easy and you will properly be guided through it by on-screen instructions. Once you complete the scenario and the quest, you will no longer take your daily quests from your faction's main ship, but from your faction's stronghold: the Violet Rise for the Alliance or the Dawnseeker's Promontory for the Horde. You will also notice that before starting your daily quests, you will have to make a choice between PvE and PvP daily quests. You will still be given 11 daily quests (not counting initial/introductory quests) followed by an elite daily quest, but there is a new daily quest location called Diremoor where you may be sent to do 2 or 3 daily quests. The new quests are presented in the table below. The Sleepless Legion / The Sleepless Legion requires you to kill 7 Animated Warriors. 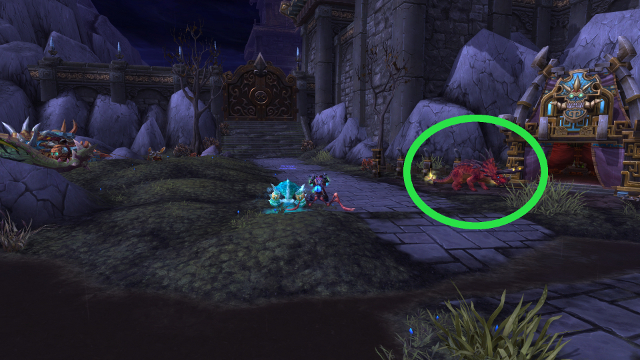 These mobs are located in Diremoor where they are often very close to Mogu enemies. Along the road that goes around Diremoor, there are a few areas where Shado-Pan units are fighting Animated Warriors. We advise you to locate these areas and kill the Animated Warriors there, as there are no Mogus around and you will receive help from the Shado-Pan. The Shuddering Moor / The Shuddering Moor require you to kill a Mighty Devilsaur. This elite mob keeps casting damaging AoE spells and breath attacks. As a result, you need to be constantly on the move (unless your pet or someone else has aggro). The Zandalari Colossus / The Zandalari Colossus require you to kill a Zandalari Colossus. 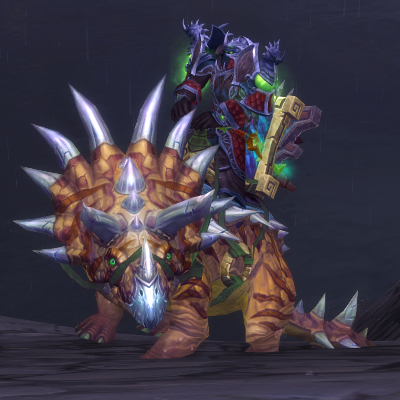 This elite mob is easier to kill than the Mighty Devilsaur. Whenever he casts something, move aside, unless there is a very large ground effect around him, in which case you need to run out of the effect. The PvP daily quests that appear with Stage 2 remain the same until the end of the event. They consist in 7 quests during which you must disrupt the other faction's operations on the island (mostly by attacking their base). After completing them, you will be given a final daily quests, which completes instantly: High Recognition from Lady Jaina Proudmoore or High Recognition from Lor'themar Theron. Unless you really need the Conquest and Honor Points, you should do the PvE daily quests. In the table below, you will find all the possible PvP daily quests (but only 7 are given each day). As soon as your server completes Stage 2, you will be able to help your faction invade a new area, from where you will be able to prepare the assault on the Thunder Forges. Lady Jaina Proudmoore will give you Tear Down This Wall! 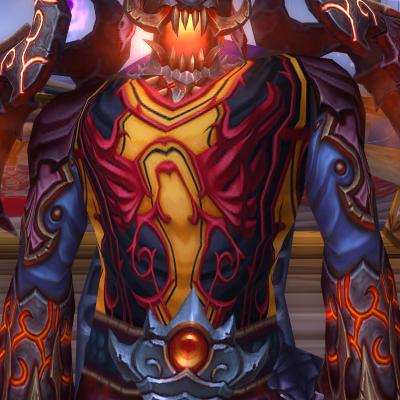 and Lor'themar Theron will give you Tear Down This Wall!. After receiving your faction's quest, simply talk to Jaina or Lorthemar to enter the scenario. The scenario itself is easy and you will properly be guided through it by on-screen instructions. Note that you can easily run through the scenario without bothering to fight the mobs. Every time you finish an objective and move on to the next one, you will lose threat on the mobs you got aggro on. Once you complete the scenario and the quest, you will receive a slightly different set of PvE daily quests at your faction's stronghold. The PvP daily quests remain the same. You will still be given 11 daily quests (not counting initial/introductory quests) followed by an elite daily quest, but there will be a few differences. You will initially receive 8 daily quests to do in the usual daily quest locations: Ihgaluk Crag, Za'Tual, the Court of Bones, and Diremoor. Then, you will be given 3 daily quests to complete in one of the two new areas that Stage 3 unlocked: The Beast Pens or the Conqueror's Terrace. Finally, you will receive an elite quest, which consists in killing one of 4 possible bosses (including the 2 bosses from the previous stages, but at a different location). Dino Might / Dino Might, you need to find 5 Saur Fetishes. While these items drop off the Saurok in the Beast Pens, it is more efficient to look around carefully, as there are many fetishes on the grounds or in the Saurok tents. Even Giants Fall / What's Inside Counts, you need to kill Guardian Tak'u. The fight is not difficult, but there is an achievement you can earn while fighting Tak'u. We explained it in our achievement section. Encroaching Force / Encroaching Force requires you to kill Nurkala, next to your faction's base. Nurkala is accompanied by 4 adds. It is important to kill the Zandalari Prophet first, as he keeps healing Nurkala. His Zandalari Fleshrender is harmless and will die easily. Once these two adds are dead, you can kill Nurkala. The only thing to watch out for are the fire and frost lines that the other two adds (which remain stationary) keep conjuring. Simply move out of them while killing Nurkala. Once Nurkala is dead, leave the area, you will soon get out of combat. You can try killing the remaining adds, but there is a chance that Nurkala will respawn before you finish. Imposing Threat / Imposing Threat requires you to kill Horgak the Enslaver inside the large building in Diremoor. This elite mob is not hard, as all his abilities have clearly visible ground effects. You simply need to move out of them. The PvP daily quests are exactly the same as during Stage 2. As soon as your server completes Stage 3, you will be able to help your faction invade the Thunder Forges. Then, you will work towards conquering Stormsea Landing. Lady Jaina Proudmoore will give you To the Skies! and Lor'themar Theron will give you To the Skies!. After receiving your faction's quest, simply talk to Jaina or Lorthemar to enter the scenario. The scenario itself is not difficult. There are two things that we would like to mention. Early on, you get to fight Beastmaster Horaki. Move out of the ground effects and you will be fine. Later on, you enter the Lightning Vein Mine where you will fight, among others, Shan'ze Electrocutioners. When these mobs die, they leave behind a lightning ball, which applies a stack of Power Surge on you. This buff lasts only 12 seconds, but each subsequent application refreshes it and increases the duration by 12 seconds. So, if you manage to get 2 or 3 stacks, it becomes easier to to keep stacking the buff. Each stack increases your haste by 10% and you can get a maximum of 10 stacks. There are now 6 daily quests to complete in Diremoor, The Court of Bones, Za'Tual, and Ihgaluk Crag. The possible daily quests remain unchanged. Then, you receive a first elite daily quest. The possible daily quests are the same as before, just that the bosses from Stage One and Two are back at their previous locations. At the same time as you receive the elite daily quest, you also receive a follow up quest to The Beast Pens or The Conqueror's Terrace where you will do 3 quests (as in Stage Three). After completing the quests in The Beast Pens or The Conqueror's Terrace, you will be sent to the Lightning Vein Mine for an additional daily quest and then to the Thunder Forges for a second elite daily quest. In the table below, we list the possible new daily quests. When questing in the Lightning Vein Mine, make sure to stack the Power Surge buff that you get when killing a Shan'ze Electrocutioner (walk through the ball of lightning he leaves behind when he dies). At the end of your daily quest in the Thunder Forge, you will fight Metal Lord Mono-Han. This is not a difficult fight. All his abilities have a visible ground effect, so you just need to move out of them. Also, you need to make sure that you do not pull any of the nearby Shan'ze Electrocutioners. Naturally, the more stacks of Power Surge you have, the easier it is to kill Mono-Han. Note that there is an achievement for killing Mono-Han with 10 stacks of Power Surge. After killing Meta Lord Mono-Han, you will automatically receive Forge Ahead! / Forge Ahead!. To complete this quest, you need to kill Itoka and Fleshcrafter Hoku, which are located on the platforms above Mono-Han. The fight against Itoka is not difficult, but it is long. Itoka's abilities all target an area around him and this area is always marked ahead of time, giving you ample time to move away. When Itoka reaches 50% health, the lightning towers located in each of the four corners of the room start powering a shield that renders Itoka immune to damage. To disable a tower, you need to click it. This will start a 4-second channel, which deactivates the tower upon completion. The problem is that there are traveling damaging electricity fields all around and if they touch you, they will cancel the channel. Also, accessing the towers is not as simple as it seems. As soon as the shield is up, the towers become surrounded by a very large electricity field, and you need to jump from platform to platform to reach them safely (all the while paying attention to the smaller, travelling electricity fields). The fight against Fleshcrafter Hoku is not difficult either. As with most of the other bosses, all you have to do is move out of clearly marked damaging zones. A few times during the fight, he will incapacitate you for a few seconds and create 3 blood slimes that will slowly travel towards him. They heal him when they reach him. Note that there is an achievement for killing him without killing any of the blood slimes. Itoka has a chance of dropping Peculiar Energy Source and Strange Metal Ingot, which both start a quest that needs to be turned in inside the room, just northeast of Itoka's location. The PvP daily quests are exactly the same as during Stage 2 and 3. As soon as your server completes Stage 4, you will be able to help your faction invade Stormsea Landing. Then, you will work your way through the final gate. Lady Jaina Proudmoore will give you A Bold Idea and Lor'themar Theron will give you Decisive Action. After receiving your faction's quest, simply talk to Jaina or Lorthemar to enter the scenario. The scenario itself is a little more complicated than the scenarios from the previous stages. At the beginning, you will ride a Thunderwing with Taoshi over Stormsea Landing. You will be given a new action bar where the 1-action will drop smoke bombs with which you will blind the sentry totems on the ground. The idea is that you should make a path for you and Taoshi from the Zandalari ship all the way up to the main gate of Stormsea Landing. Once you have landed on the ship with Taoshi, she will keep you stealthed and will order you to kill enemies with the extra action button that will have appeared on your screen. If you somehow get out of stealth, Taoshi will conjure a purple cloud of smoke into which you need to run, in order to become stealthed again. Disabling the right sentries and properly staying in stealth are the only two things to watch our for during this scenario. After finishing it, your PvE daily quests will have one additional quest at the end. Raiding the Vault / Raiding the Vault. During Raiding the Vault, you will be able to obtain a very easy achievement. The PvP daily quests are exactly the same as during Stage 2, 3, and 4. Once your server has completed Stage 5, you will be given the final quest: The Fall of Shan Bu from Lady Jaina Proudmoore or The Fall of Shan Bu from Lor'themar Theron. After accepting the quest, talk to your faction's leader to enter the final scenario. We will not say anything about it so as not to spoil your experience. Completing the scenario completes the event, but you will still be able to do your daily quests from the Violet Rise of the Dawnseeker's Promontory. They will be exactly the same as they were during Stage 5. In average, you will gain about 2,000 reputation a day, so it should take you 3 weeks to reach exalted reputation. After reaching revered, you should buy a commendation from your faction's quartermaster: Grand Commendation of the Kirin Tor Offensive or Grand Commendation of the Sunreaver Onslaught. This will make you gain 5 days. Sunreaver Onslaught Insignia or Greater Sunreaver Onslaught Insignia. Thanks to these insignias and the commendation, you should be able to reach exalted reputation in 2 weeks. 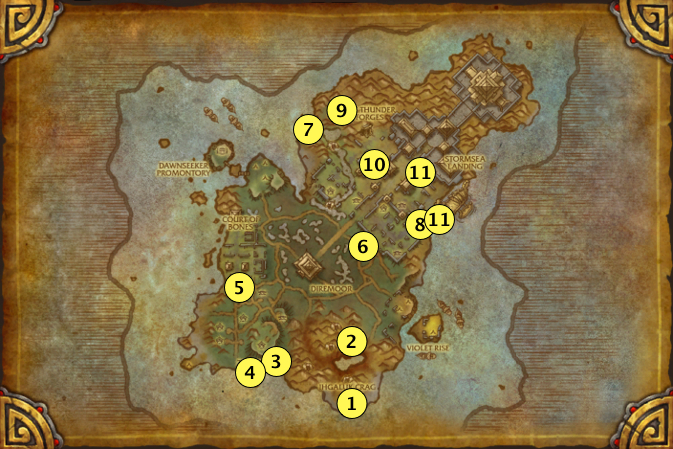 Once a week maximum, you will loot a Keys to the Palace of Lei Shen from mobs on the island. You can also obtain these keys by looting Troves of the Thunder King (big golden chests at random locations on the island) and opening Arcane Troves or Sunreaver Bounties at the end of your daily quests. You can turn in this key to Taoshi at the Shado-Pan hideout. The first time you do so, you will be able to complete Treasures of the Thunder King, which gives 500 reputation with the Shado-Pan Assault. Giving a key to Taoshi enables you to enter the Troves of the Thunder King scenario, which we also call the loot run scenario. You have 5 minutes to go through the instance and the goal is to loot as many chests as possible. The chests can contain a variety of items: Elder Charms of Good Fortune, Shan'ze Ritual Stones, Tattered Historical Parchments, Burial Trove Keys, etc. After 5 minutes, you will be teleported to Taoshi, in another room of the instance where there will be many chest that require a Burial Trove Key to open. They have a higher chance to contain the same rewards than the chests in the rest of the instance. If you successfully manage to complete the instance, by reaching Tenwu of the Red Smoke within the 5-minute timer, you will still be teleported to Taoshi, but you will also receive a Burial Trove Key as a reward. During PTR testing, we made a video that covers everything you need to know about the Troves of the Thunder King (including the In the Hall of the Thunder King achievement). You can watch it below. Polymorphic Key (Alliance / Horde) opens doors without you having to pull the associated lever (it can make you gain a lot of time in the second and third rooms). The Shan'ze Ritual Stones, which you can obtain through various means, are needed to summon bosses around the island. The reason why you want to summon these bosses is to complete a weekly quest that rewards 150 and to complete one of the achievements. Your first contacts with the Shan'ze Ritual Stones will be when you will receive the Secrets in the Isle of Thunder quest at the Shado-Pan hideout and when you will stumble upon the Head of the Chamberlain object, which starts The Crumbled Chamberlain. We will talk more about Secrets in the Isle of Thunder in the next section. The Crumbled Chamberlain is a weekly quest, so you will be able to repeat it. One of the quest objectives, the Hair of the Chamberlain only becomes accessible when you reach Stage 3, so you will only be able to complete this quest after reaching Stage 3. 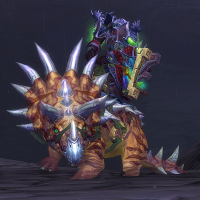 Another of the quest objectives, the Shoulders of the Chamberlain can only be accessed after completing the Skin of the Saurok / Skin of the Saurok quest. In addition to the Chamberlain quest, you will obtain stones by killing rare elite mobs around the island (you can obtain a maximum of 1 stone a week from elites), by looting chests in the Troves of the Thunder King scenario, by looting Troves of the Thunder King on the island (big golden chests at random locations), and by opening Arcane Troves or Sunreaver Bounties. The only purpose of the Shan'ze Ritual Stones is the summoning of the island's bosses. There are 9 bosses in total: 3 Lightning bosses, 3 Primal bosses, and 3 Spirit bosses. Every week, you will need to kill 1 boss of each type to complete Champions of the Thunder King, a quest that rewards 150 . Each boss is summoned at a very precise location (which we give in the next section), by clicking a nearby Ritual Stone. This will give you one attempt on the boss and will consume 3 Shan'ze Ritual Stones. Wiping means wasting 3 stones. We strongly recommend you to be in a proper 5-man party to kill these bosses. Only one player in the group needs to use his stones. After gathering 3 stones, you will be able to complete Secrets in the Isle of Thunder. The follow-up quest is Setting the Trap, which requires you to summon Echo of Kros, by clicking the Spirit Ritual Stone on the beach of Ihgaluk Crag, next to the altar, and kill him. Then, you will finally be given Champions of the Thunder King (the weekly quest). On subsequent weeks, you will directly obtain this weekly quest from the Shado-Pan hideout, without having to do the introductory quests again (this will save you 3 stones). 7. Qi'nor Lightning On the upper platform outside of the Lightning Vein Mine. 8. Incomplete Drakkari Colossus Primal On the lower platform outside of the Lightning Vein Mine. 9. Windweaver Akil'amon Primal On the platform accessible through the dirt path leaving from the northeastern end of Stormsea Landing. Make sure to check the video link for each boss to have a better understanding of what they do. Note that the Ancient Mogu Guardian requires your server to have reached Stage 3, Qi'nor and the Incomplete Drakkari Colossus Stage 4, and Windweaver Akil'amon Stage 5. There are 11 rare elite mobs on the island. They all have a chance to drop Tomes of Valor, Shan'ze Ritual Stones, etc. There is no tagging system for these elites. If you join a fight, then the mob's health will be increased by 50% of its base health and you will still get your objective completed when the mob dies. Below, you will find their respective locations. Killing all these elite mobs (except Ra'sha) will grant you the Champions of Lei Shen achievement. Make sure to check the video link for each boss to have a better understanding of what they do. Note that God-Hulk Ramuk requires your server to have reached Stage 3, Backbreaker Uru and Lu-Ban Stage 4, and Molthor Stage 5. Note that Ra'sha will drop a Ra'sha's Sacrificial Dagger, which you can use to instantly kill your character. In addition to Kirin Tor Offensive and Sunreaver Onslaught, which you will earn when reaching exalted reputation with your faction, there are 25 achievements that you can earn on the Isle of Thunder. They are listed below. Stormbreaker (meta-achievement that rewards the the Stormbreaker title). Note that Zul'Again, another new achievement of Patch 5.2 seems to have nothing to do with the Isle of Thunder. To complete Blue Response, you need to scare off a rare blue Hatchling Skyscreamer. 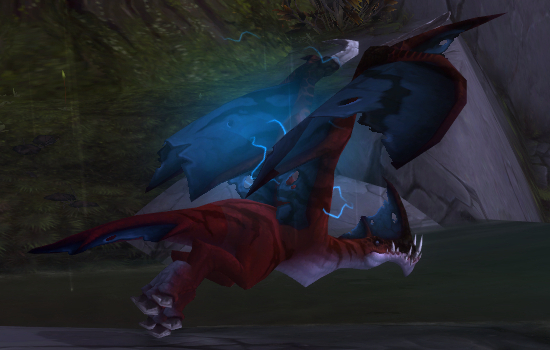 Hatchling Skyscreamers are found on the southwestern part of the Za'Tual beach and approaching them is enough to scare them off. We obtained this achievement one day while doing the Preventing a Future Threat / Preventing a Future Threat daily quest. The achievement simply triggered all of a sudden and the same will probably happen to most people. To complete Boop, you need to knock off a Zandalari Beastcaller from his flying mount. There are many of these Beastcallers in Za'Tual, and to knock them off, you need to attack them or their mount. We tried both ways, but the achievement did not trigger for us. We assume that this was a PTR bug and that it will be fixed on live servers. To complete the In the Hall of the Thunder King achievement, we advise you to watch our video of the instance. 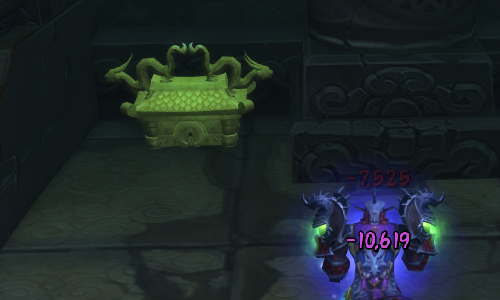 The objective that requires you to open 10 Golden Treasure Chests in a single run will most likely require you to use items from your quartermaster, such as A Common Rock (Alliance / Horde), Arcane Propellant (Alliance / Horde), and Polymorphic Key (Alliance / Horde). Pay to Slay requires you to kill a summunable boss. Ready for RAAAAIIIIDDD?! ?ing requires you to kill 200 Ihgaluk Roaches in 1 minute (the same roaches you need to kill for the The Creeping Carpet of Ihgaluk / The Creeping Carpet of Ihgaluk daily quests). This is a very difficult achievement, and unless you can group up to do it, it will be nigh impossible to complete, especially on days where The Creeping Carpet of Ihgaluk / The Creeping Carpet of Ihgaluk is given to players. The Sacred Mount: inside the large building in Diremoor, on the southeastern side (47.06, 59.90). The Crumble Bundle requires you to finish the The Crumbled Chamberlain weekly quest within 10 minutes of accepting it. The quest ends at the Chamberlain's statue beneath the Courts of Bone, so plan your route in such a way that you can easily get back there. Horde players can Hearthstone back to the Dawnseeker's Promontory and reach the statue in less than a minute. You may not be able to complete this achievement in the first few weeks, as it requires to become accustomed with the various spawning spots for each part. The Mogu Below-gu and These Mogu Have Gotta Go-gu require you to summon and kill Forgemaster Deng, Haqin of the Hundred Spears, and SparkmancerVu in The Court of Bones. in the southernmost platform, you will find both Deng's and Haqin's statues. To complete This Isn't Even My Final Form, you first need to kill a Drakkari God-Hulk in Ta'Zual. This will give you Mighty Loa, which lasts 5 minutes. Then, all you need to do is find a Zandalari Potion and click it. You will find plenty of them on the ground in Za'Tual. You can also click a Zandalari Potion first and then kill a Drakkari God-Hulk. To complete When in Ihgaluk, Do as the Skumblade Do, you need to /bow before Kroshik, a sort of tyrannosaur, when he is in the following forms: Egg, Baby, Adult, and Sacrificed. Sacrificed: on the altar on the beach of Ihgaluk. To complete For the Ward!, you need to finish off an opponent with a Sunreaver or Kirin Tor perimeter ward. 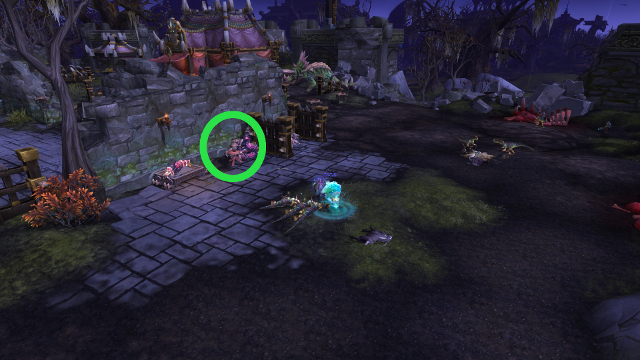 Alliance players need to kill an opponent near a Kirin Tor perimeter ward (which can be found all around the Violet Rise), and make sure that the ward deals the killing blow. Horde players need to do the same thing with Sunreaver perimeter ward (which can be found all around the Dawnseeker's Promontory). On the PTR, the perimeter wards would only attack players of the opposing faction and not random mobs that you would kite to them. Direhorn in a China Shop can be completed in The Beast Pens. You simply need to kite the Loa-Infused Bloodhorn to the Priceless Zandalari Vase and get it to charge it. Basically, you need to stand on the vase and hope that the Bloodhorn will charge you (which he will not do if you are within 15 yards of him). Do not kill the Loa Speaker accompanying the Bloodhorn, as otherwise the beast will become friendly and will not charge you. In the following screenshots, the Bloodhorn is marked on the left screenshot and the Priceless Zandalari Vase is marked on the right screenshot. Our Powers Combined requires you to kill Guardian Tak'u with and without his buffs. Guardian Tak'u is located in The Conqueror's Terrace. He is surrounded by 4 priests. Each of them is giving him a buff. 30 seconds after you start attacking one of the priests, Guardian Tak'u activates and will retain the buffs of any of the priests you have not killed. If you want to fight Guardian Tak'u with all the buffs, all you need to do is attack one of the priests and wait for 30 seconds. The fight with all the buffs is not difficult, but you will be required to interrupt his fire-based spell and dispel a healing HoT he puts on himself. If you want to fight Guardian Tak'u with no buff, you need to pop all your offensive cooldowns and kill all 4 priests before Tak'u activates. Then, the fight is very easy. Speed Metal requires you to kill Metal Lord Mono-Han in the Thunder Forges with 10 stacks of Power Surge. To complete the achievement, head for the Lightning Vein Mine and kill Shan'ze Electrocutioners until you have 10 stacks of Power Surge and then kill Mono-Han. Note that getting the first 2 stacks is the only difficult part. When a Shan'ze Electrocutioner dies, he leaves behind a lightning ball that grants you 1 stack of Power Surge if you walk through it. The problem is that the buff lasts only 12 seconds, so it has plenty of time to drop before you get another stack. When you refresh the buff by killing another Electrocutioner, it is refreshed and 12 seconds are added to it. So, we advise you to kill 2 Electrocutioners at the same time and get 2 stacks of the buff for a 24-second duration. Killing a third Electrocutioner will refresh the duration to 36 seconds, a fourth to 48 seconds, and so on up to 2 minutes with 10 stacks. You Made Me Bleed My Own Blood requires you to kill Fleshcrafter Hoku in the Thunder Forges without killing any of the small blood slimes he extracts from you (the Possessed Bloods). Refraining from killing these slimes only causes Hoku to get healed a bit, so the fight will last slightly longer. Note that if another players kills all the blood slimes and you do not kill any, you will still get the achievement. Champions of Lei Shen is completed by killing all the rare elite mobs of the island, with the exception of Ra'sha. It Was Worth Every Ritual Stone requires you to kill all the summonable bosses of the island. Platform Hero can be earned in the Swollen Vaults, the entrance of which can be found in Stormsea Landing. As you enter, you will notice that you need to jump from pillar to pillar to reach the other side of the vaults. There are 25 pillars, laid out in a 5x5 pattern. On each pillar, there is damaging lightning that will knock you back and make you fall on the statues below. There are always 3 pillars without lighting. They form a contiguous safe zone which slowly moves around, 1 pillar at a time. As soon as this safe zone reaches your side, hop in, and follow it from pillar to pillar for 90 seconds. The Dark Prophet Zul: next to the large chained tyrannosaur in The Beast Pens (52.65, 41.39). The Curse and the Silence: on the platform accessible from the upper exit of the Lightning Vein Mine (49.89, 20.40). Isle of Thunder is automatically completed when you finish the scenario that marks the end of Stage 5. Stormbreaker is the meta-achievement of the event. It rewards the the Stormbreaker title. 19 Mar. 2013: The elite quests Encroaching Force and Imposing Threat are given earlier than on the PTR. The guide has been amended to reflect this. 14 Mar. 2013: Added location for the Egg of Kroshik. 13 Mar. 2013: Fixed location of Forgemaster Deng's statue. 13 Mar. 2013: Moved the Diremoor daily quests to Stage 2 (on the PTR, these quests were only offered starting from Stage 3). 12 Mar. 2013: Fixed location of Ancient Mogu Guardian. 07 Mar. 2013: Clarified means of obtaining Keys to the Palace of Lei Shen and Shan'ze Ritual Stones. 07 Mar. 2013: Kirin Tor Beacon and Sunreaver Beacon no longer share a cooldown with your Healthstone. 06 Mar. 2013: Added a mention of the fact that Thunder Calls, the starting quest for the event, is only given when you are in the Vale of Eternal Blossoms. 04 Mar. 2013: Removed Pierre, as it was removed from Patch 5.2. 04 Mar. 2013: Pierre and Sky Claw are crafted by Engineers, not Jewelcrafters (as the guide was previously mentioning).